We welcome the second season premiere of the show with a two-part episode. 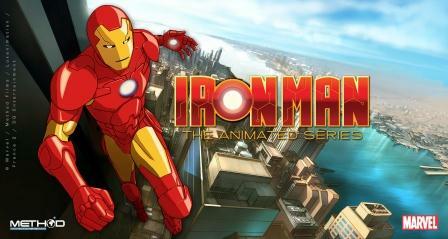 Part One begins with viewers witnessing a heist by some old enemies of Iron Man: Unicorn and Shriek. As they load a van with some thugs, they comment that Iron Man has not been seen in the city for some time. Upon completing their haul, we are greeted by War Machine piloted by Rhodey. He makes short work of them both, however he makes it clear he is still new to piloting the armor. Tony steps off of a private jet where Pepper is there to meet him. He says that he has been in China for the past few months looking for the Mandarin, the Makluan Rings, and his father. If you recall in the last episode of Season 1, the Mandarin (who is Gene Kahn) said that Tony’s father, Howard, is alive and is being held captive to aid him in finding the rings needed for powering his suit. After searching for so long, Tony is no closer to finding any of them. He is starting to believe that the Mandarin may have been tricking him into believing his father is alive in order to force his cooperation. Just then, the scene changes once again (which seems to be a theme for this episode, so bear with me). The Mandarin’s search for the remaining 5 Makluan Rings is very much in full swing. And, sure enough, Howard Stark is alive and aiding him in his quest. They seem to be on a mountain somewhere, though it is never said where. Howard is also helping him in return for the safety of his son. We finally get to the crux of the story for this episode when Mr. Fix is seen talking to a mysterious figure. He has repaired Whiplash’s armor and added several enhancements. The figure on the screen says he wants to have the Iron Man armor and Justin Hammer brought to him. Whiplash heads to Stark International where Hammer will be. Iron Man is also present at the meeting, spying to find out that Hammer is trying to buy out the company. A battle ensues as Whiplash abducts Hammer, and Iron Man is the victor. Whiplash return to Mr. Fix to be chastised for losing his target. The mysterious figure reappears and interrupts the conversation to add Obidiah Stane to his hit list. Whiplash wastes no time and heads immediately for Stane. Iron Man and War Machine (in typical cartoon fashion) happen to be flying around the city on patrol when they see Whiplash. There is an elaborate chase scene ending in an excellent rooftop battle. This sprawls into the city streets where War Machine has been knocked out of the fray, leaving Iron Man and War Machine to duel. Whiplash gains the upper hand quickly and wraps his whips around the armor and begins to increase its power exponentially. Tony tries to eject from the suit before it cooks him alive, but because the whips are wrapped around his body completely, the eject sequence fails. There is an immense explosion and Whiplash takes off, Stane in his arm. Tony manages to survive the blast, but his heart is failing. War Machine flies him to the hospital, where they await Dr. Yinsen, the cardiologist who invented Tony’s pacemaker. Without his help, Tony will surely die.